(Window on Eurasia – Paul Goble – Staunton, June 18, 2013) Andrey Kazantsev, the director of the Analytic Center of the Russian Foreign Ministry’s Moscow Institute for the Study of International Relations (MGIMO), says that the borders of the countries of the Central Asian region are likely to change over the next century and that this prospect should worry Russian policy makers. In an 1800-word essay on the Rusichi Center portal, the MGIMO analyst outlines five different scenarios under which these changes could occur, the role of external and internal factors in this process, and the probabilities for each of them (rusichi-center.ru/e/3170795-pyat-stsenariev-buduschih-granits-tsentralnoy-a). The terrorist attacks on the United States on September 11, 2001, he says, showed that “the collapse of states of this region which had ceased to be able to control their borders could have serious consequences at the other end of the world” and prompted the US and other powers to get more involved there. Such external involvement, which focuses on the resolution of regional problems like terrorism, drug trafficking, and failed states and the use of this region as a north-south or east-west trade route, is likely to have an impact on the borders of the Central Asian countries in the future. The second scenario would involve “the re-establishment of the Soviet Union or the Russian Empire.” This is much less likely than the first, but its probability is “not zero even now,” although the prospects for such an outcome, Kazantsev says, “are rapidly decreasing with each passing year. The fourth scenario would be the creation of an Islamist khalifate on some or all of the territory of the region. That would reflect both external influences and internal developments. Finally, there is a fifth scenario, one that has more to do with internal factors than with external ones. That would see border changes happen as a result of the weakness of the existing states, the continuing strength of supra- and sub-national identities, and the inability of governments to block fragmentation or even collapse with new states emerging on the model of Southern Sudan. 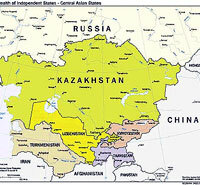 Despite the fact that “ethno-national identities have arisen in all the republics of the former Soviet Central Asia and even a civic (Kazakhstan) identity as arisen in Kazakhstan, these states have not overcome either the smaller or larger identities, and these could play a role in future border changes. Of these five possible scenarios, Kazantsev argues, the first ­ Chinese expansion ­ and the last state failure and disintegration ­”are more probable than all the rest.” Moreover, they do not contradict one another because the dangers of disintegration to its west would be a particularly powerful motivating force for Beijing to extend its control over that region.